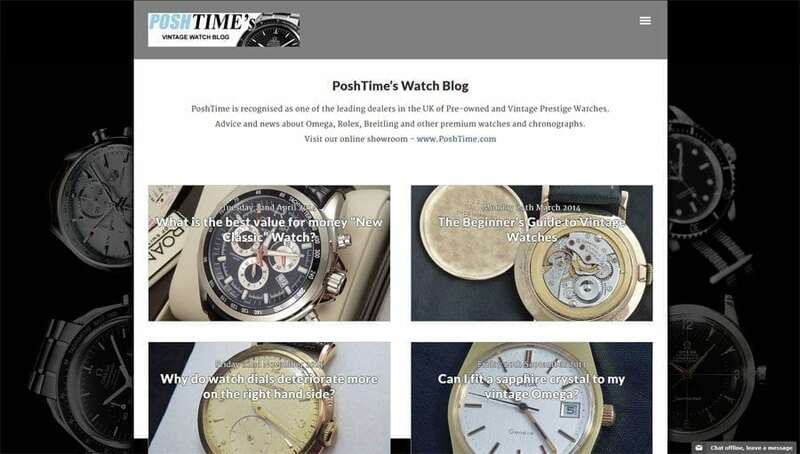 Responsive Blog for Vintage Watch Dealer designed to showcase watches and build the PoshTime brand. Traffic to your website is important especially if you are selling something. Blogging is a sure fire way to ensure traffic is increased and it’s a great way to provide a commentary on a specialised subject. Blogging helps the customer identify with you and your business and assists in the authenticity of your product or service. The new blog was re-written and SEO utilized. The blog was designed to mirror the shop’s branding and show integration between the blog and the main shop site. The whole format was optimised and enabled for mobile and smartphone devices as well as large monitors down to normal laptop screens and tablets.